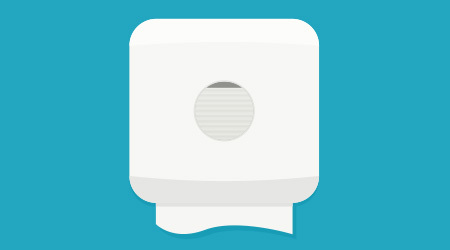 What can I use to combat odors in restrooms if there are sensitive occupants in the building? When there is a concern of sensitivity in fragrance with personnel and occupants in the building, you may consider the following: Use a 1:256 germicide cleaner for mopping and fixture wipe down. After cleaning the restroom using best practices and procedures, always pour leftover germicide down the floor drains before emptying the bucket. This will allow for the quaternary ammonium compound to destroy any odor-causing bacteria coming from the drains. In addition, when cleaning you may want to use a germicide or enzyme and spray around toilets and commodes, floors and hard surfaces. Allow for the enzyme and germicide to stand while doing other cleaning task; this, too, will help reduce odor. In reference to reducing odors, there are enzyme-based “no fragrance” units that can be installed on flushers or designed to work automatically in urinals and commodes. Fragrance cabinets to be used would be passive or fan units. These units disperse neutral and low fragrant oils. Aerosols cover more cubic feet and deliver larger doses, therefore aerosols cabinets may not be the best fit. A hard surface cleaner and deodorizer are the primary components for bathroom cleaning. Enzyme-activated products would be more suitable to eliminating odors because they would help alter the composition of the source of the odor. Fragrances simply mask odors vs. eliminating them. And, many people are allergic to fragrances. Enzyme cleaners are non-toxic and non-caustic, but some people do have allergic reactions to enzymes when inhaled. However, they are free of harsh fumes and vapors, phosphates, chlorine and petroleum surfactants, which are bothersome to many people. Enzymes are part of biological systems, and when their work is finished, they return to a natural, biodegradable and non-toxic state. Enzymes work in a less harsh manner than alkaline or acidic cleaners and can be used safely on any surface that can also be cleaned with water. Hydrogen peroxide-based products are a great hard surface cleaner and work well in restroom areas. Stains and dirt on tile, stone, and grout can be brought to the surface with an application of this type of product, and then and easily wiped away. Hydrogen peroxide has a pH of about 6.5, but when combined with other agents in the final product, can be a neutral cleaner as well. It works well for either alkaline, acidic or protein stains. Be sure the products used, including the bio-enzymatic products, are green certified. Secondly, you need to treat all three dimensions — the air, the surfaces and the sub-surfaces. For the air, use a dedicated/specialized bio-enzymatic odor eliminator designed for washrooms and their type of soils. Mist into the air and around the urinals and toilets when done cleaning. For floors and other hard surfaces, use a dedicated/specialized bio-enzymatic cleaner designed for washroom cleaning and their type of soils. When done, dump the solution down the floor drains to treat these areas. For urinals, be sure to use bio-enzymatic urinal pucks. For all, ensure disinfectants are not used on the same surfaces.